"This Fender medium scale acoustic bass is great for writing or just playing in the room without an amplifier.. It has some interesting acoustic sounds and has a really nice feel. It's not at all expensive, which is a relief if you want to take it along to the beach or to informal acoustic jams and really bang around on it. With a really sophisticated Fishman pre amp and EQ system and a built in tuner, it just feels great for a variety of applications." The T-Bucket Bass is the first bass guitar in Fender's Hot Rod Design series - and it sounds great unplugged or plugged in. You get the best of both worlds - mellow, woody acoustic bass tones that provide solid rhythm without sounding boomy. It is certainly no where near as loud as my Warwick Alien, but it still does an admirable job of keeping up with acoustic guitars in the room without the benefit of a bass amp. Since this is a fairly new model, I will post a review I found of the bass here. To be honest, I am not usually a fan of acoustic bass guitars. I’ve found only a few that I enjoyed playing, and I wouldn’t take most ABG’s to a real-world gig. But the T-Bucket is an exception: A modest, laminated acoustic instrument whose easy playability, familiar neck, and flexible electronics go a long way toward making this hot rod ready to race. The Fender electric bass is recognized worldwide as an icon of 20th century American design and innovation. Without its invention there may have been no rock’n’roll, no Beatles, no Stones, no Motown, soul or pop, nor any music that relies on the sound of bass, drums and guitar as its foundation. No modern music could exist without it apart from computer generated bass from samples. Strange then that the first acoustic bass as we know it – launched in 1972 under the Earthwood brand – was invented not by Fender, but by Ernie Ball and former Fender employee George Fullerton. By the end of the eighties, the acoustic bass was everywhere, thanks in part to MTV’s Unplugged series and the rise in popularity of rootsier music styles which followed the excesses of big-haired rock. Many people pick up an acoustic bass and expect it to sound like a double bass. It may go some way to emulating the larger beast when plugged in – especially if it’s a frestless model – but the comparative body sizes preclude the instruments sounding anything like each other unfortunately. However, modern acoustic basses can easily hold their own in all-acoustic ensembles and if there’s a need to plug in, they are nearly all now factory fitted with a pick-up and pre-amp system as standard. 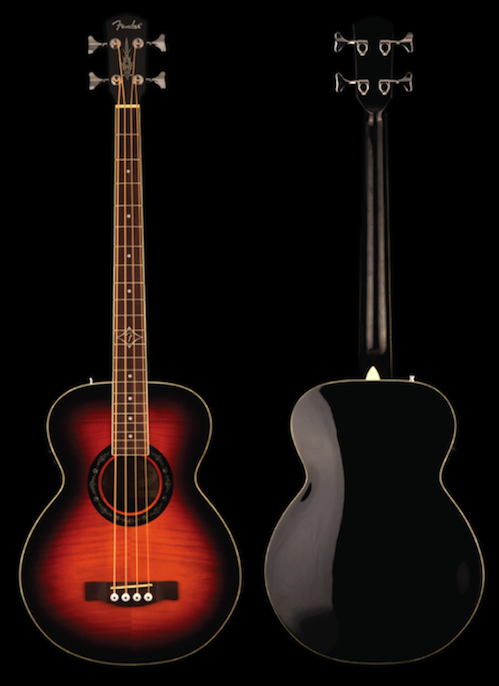 The new Fender T-Bucket Acoustic Bass is no exception. Part of the Fender’s Hot Rod Design series, it features a non-cutaway Grand Concert body style and an on-board Fishman Isys III pickup system with active pre-amp and tuner. The Fender T-Bucket Acoustic Bass also features a laminated flame Maple top with scalloped X bracing, laminated Mahogany back and sides, Mahogany neck with dual-action truss rod and a 3-colour gloss Sunburst finish with Ivory body and neck binding. Rosewood is the chosen fingerboard material, which has been inlaid with an ’F’ at the 12th fret and there’s yet more inlay on the head stock and rosette – a ’pin striping’ effect by Fender Hot Rod artist Vince Ray. Other features include a Rosewood bridge with compensated saddle for better intonation and a forward strap button. Scale length is set at a medium 32“ for easier playability and the factory set up with a Fender Phosphor Bronze Acoustic Bass 45-95 set includes a comfortable low action without any noticeable string buzz. Fender has equipped the T-Bucket with a Fishman Isys III System which includes an active pre-amp, Volume control, 3-Band EQ and Tuner. The output socket and battery compartment can be located on the bottom bout of the bass and the positioning of this plate and the pre-amp has been well thought out and adds to the general impression that the T-Bucket is an ideal instrument for live work. Acoustically, the Fender T-Bucket is a bit of a surprise. So many acoustic basses sound far too trebly to my ears and lack any ’thump‘ until plugged in. That is not the case here; the T-Bucket has a pleasantly woody bottom end on the low E string with some real bass response. The instrument also produces an impressive overall volume level and the individual strings are well balanced, again, not always the case. Finding a Fishman system on an instrument that’s so affordable as the T-Bucket is also impressive. Although the Isis III is a basic affair it does a great job, enhancing an already decent sounding bass and giving it the power to hold down a substantial bottom end in any acoustic based ensemble. The T-Bucket is lightweight too and because of the comparatively small body and the medium scale, the bottom frets won’t be out of reach for the average person. Despite its comparatively late start in the acoustic bass field, Fender – as you would expect – is now firmly established in spite of plenty of competition from all quarters. However, with a instrument as good as the T-Bucket, I don’t think it has too much to worry about. The Hot Rod Design series now welcomes its first bass guitar to the family - the Fender T -Bucket Grand Concert Acoustic-Electric Bass. With its medium scale length, this one's ideal for guitarists who want to switch over or for younger players. This bass is a light 5.6 lbs and the width of the neck at the nut is 42mm. You’ll get all the acoustic lowdown you need from its grand concert body style, Fender phosphor bronze acoustic bass strings and Fishman® Isys™ III pickup system with onboard active pre amp and tuner. Features include a beautiful flame maple top with scalloped X bracing and a classic Fender Three-color Sunburst finish, mahogany back and sides, easy-to-play 32” medium scale length, gloss-finish mahogany neck with dual-action truss rod, Ivory body and neck binding, rosette and head stock pin striping inlay, 12th fret “F” inlay and pin striping by noted hot rod artist Vince Ray, rosewood bridge with compensated saddle and forward strap button.